Makeup brush empty Canister is a cylindrical case and is perfect to travel with your makeup brushes. When opened, It keeps your brushes upright while you do your makeup. 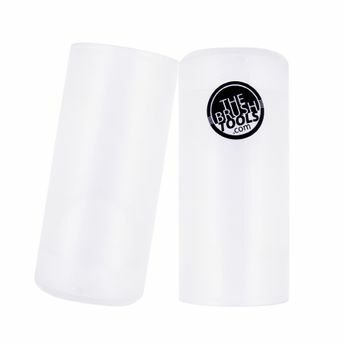 It is an ideal pick to keep your brushes free from dust at home. It has an adjustable size with 5 different heights that holds makeup brushes of any size. Perfect for all your travel needs to keep your makeup brushes in one place. An adjustable size with 5 different heights to hold makeup brushes of all sizes. Made from plastic and so hygienic and easy to clean. Additional Information : The coolest makeup tools are here. The Brush Tools brings you an innovative selection of products to help you with your makeup routines and maintenance. Find your perfect product within their extensive range! The Brush Tools is a brand whose products help all lovers of makeup. They are known for brushes and cleaning products, Organization and care of brushes. Explore other options for Makeup Brush Sets here. Explore the entire range of Brush Sets available on Nykaa. Shop more The Brush Tools products here.You can browse through the complete world of The Brush Tools Brush Sets .